These findings are described in the article entitled Experimental capture and handling of chum salmon reveal thresholds in injury, impairment, and physiology: Best practices to improve bycatch survival in a purse seine fishery, recently published in the journal Fisheries Research (Fisheries Research 206 (2018) 96-108). This work was conducted by Katrina V. Cook and Scott G. Hinch from the University of British Columbia, Maryann S. Watson from Dalhousie University, David A. Patterson from Fisheries and Oceans Canada, and Andrea J. Reid and Steve J. Cooke from Carleton University. 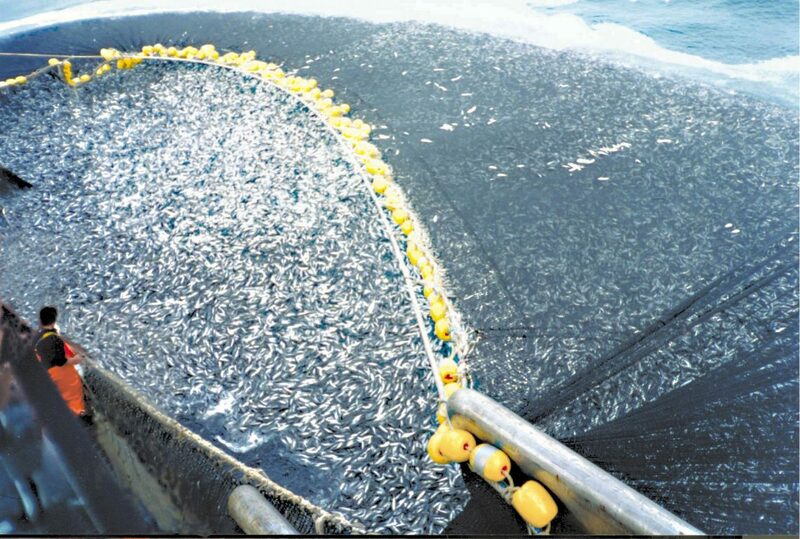 The winches of the commercial purse seine vessel squeal to draw in the enormous net, and the crew rushes over to inspect their catch. 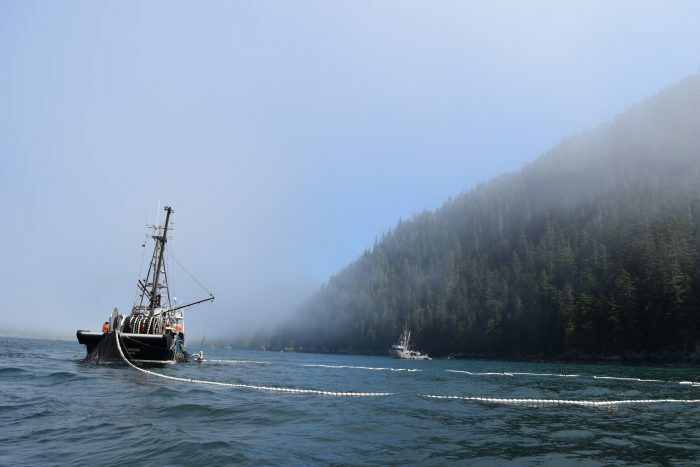 Hundreds of Pacific salmon thrash about, flashes of silver against the dark cords of the net, but the keen eyes of the fishermen can quickly identify the mix of species within the net – pink salmon, chum salmon, and a few sockeye. These salmon species are all migrating from feeding grounds in the open ocean to their natal rivers to spawn. It is during this migration that they are the target of fisheries, and in the coastal waters of British Columbia often a mix of species are captured, some of which are targeted and others are bycatch. Here on the north coast of British Columbia, these fisheries may only keep the Pink salmon, so this catch will need to be sorted onboard. Bycatch refers to any animal that is captured by fishing gear but is not the intended species, population, or size class. Some bycatch will be retained, but most are discarded and a high proportion of discarded bycatch will not survive the encounter. Commercial fisheries are often criticized for unsustainable impacts to bycatch. However, if the amount of bycatch is low and they can be released in such a way that they are minimally impacted by the encounter, then discarding may be a good option to reduce the impact of fishing to non-target populations. With growing world consumption of fish protein, it is becoming increasingly important that commercial fisheries are managed to minimize impacts. One means to do so is through improving the release of bycatch such that the survival of these fish is increased. Specific recommendations and protocols regarding handling and release are lacking from most commercial fisheries that practice bycatch discarding. We focused on two aspects of this handling process, the time fish spent within the net alongside the boat, and the time spent exposed to air onboard. Our research sought to evaluate the effects of handling and release of these chum salmon bycatch using minimally invasive sampling methods including assessments of blood physiology, injury, and reflex impairment (i.e., ability to respond to stimuli). We aimed to inform specific handling protocols to maximize the survival of salmon released from purse seine fisheries, the fishery accounting for the largest proportion of harvested biomass of salmon in British Columbia. Onboard multiple purse seine vessels over two fishery seasons, we conducted trials with changes to net handling and sorting methods to create various levels of capture severity and monitored characteristics that make fish particularly vulnerable to stress from capture. We assessed changes in fish injury, responses to stimuli, and measured blood indicators of stress and exhaustion (lactate, glucose, and chloride). By comparing changes in reflex impairment with blood physiology data, we were able to identify thresholds both for the time within the net and air exposure duration, after which the condition of fish deteriorated such that we may assume poor survival after release. 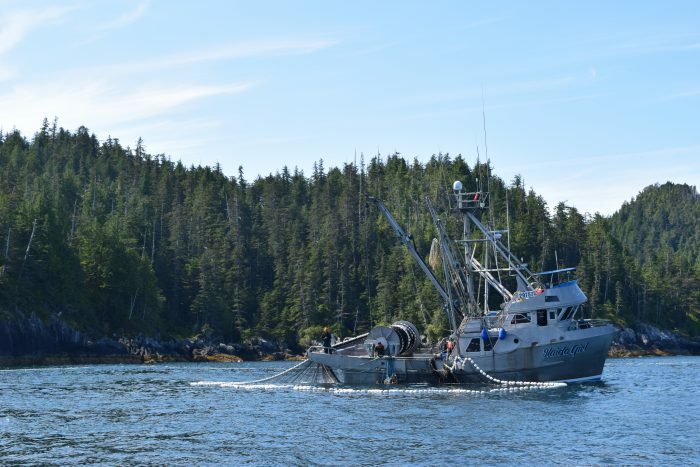 We were able to provide some clear and practical recommendations for handling, including that nets be left loose to reduce crowding, and that fish be sorted as fast as possible to minimize air exposure. Our data specifically pointed to keeping time fish spend within the net under 15 minutes, and time exposed to air to between 1 and 2 minutes as being important to survival outcomes. However, an important additional finding was that females and less mature fish were more likely to sustain injury during capture. With maturity, there are pronounced changes in body morphology, including a thickening of the skin. These changes seem to provide a form of protection from injuries. The fishery should be managed according to expected impacts to females, and harvests timed to only discard non-target species when they are more mature. By providing these specific recommendations for the handling and release of Pacific salmon from purse seine fisheries, changes can be put forward by fishing crews to keep incidentally-captured chum salmon (and potentially other salmonid species) below the injury, impairment, and physiological threshold points we identified. This research improves our fundamental understanding of the effects of acute stress on the physiology and survival of fish and can be directly applied to improving the welfare of fishes discarded from fisheries. This approach could be applied to most fisheries that discard fish to provide recommendations that could enhance bycatch survival. I am a PhD candidate in UBC's Pacific Salmon Conservation and Ecology Laboratory. Working with commercial fisheries for Pacific salmon, I study those salmon species that are released as bycatch. Merging telemetry and marine holding studies with physiology and genomics, I aim to understand how various capture scenarios influence individual condition and post-release mortality. Many of my research questions have direct implications for the management of BC's Pacific salmon fisheries; I, therefore, incorporate human dimensions research to evaluate stakeholder perceptions of my findings. My research is the result of strong collaborations with various groups involved with salmon fisheries. Maryann graduated from the University of Victoria with a BSc. During her Master of Marine Management degree, Maryann pursued her interests learning how solutions are developed using both scientific and socioecological data. In the summer of 2015, Maryann undertook an internship with Watershed Watch Salmon Society and collaborated with the University of British Columbia's Pacific Salmon Conservation and Ecology lab on a project examining the handling methods of incidentally caught chum salmon in the pink salmon purse seining fishery on BC's North coast. Previous Post« Previous Who Knew What Tau In Oligodendrocytes Can Do?